Build Quality (9/10): The build of the ATH-M50 is quite similar to that of the Denon DN-HP700 – heavy plastics intertwined with metal structural and cosmetic elements. The cord is long and thick and the 3.5mm plug is relieved with a metal spring. Overall a very solid construction that definitely feels like it should stand the test of time. Comfort (9/10): The oval pads of the ATH-M50 work very well without being too large. Both the headband and earcups are padded more generously than those on my Denon HP700 and Ultrasone HFI-450. 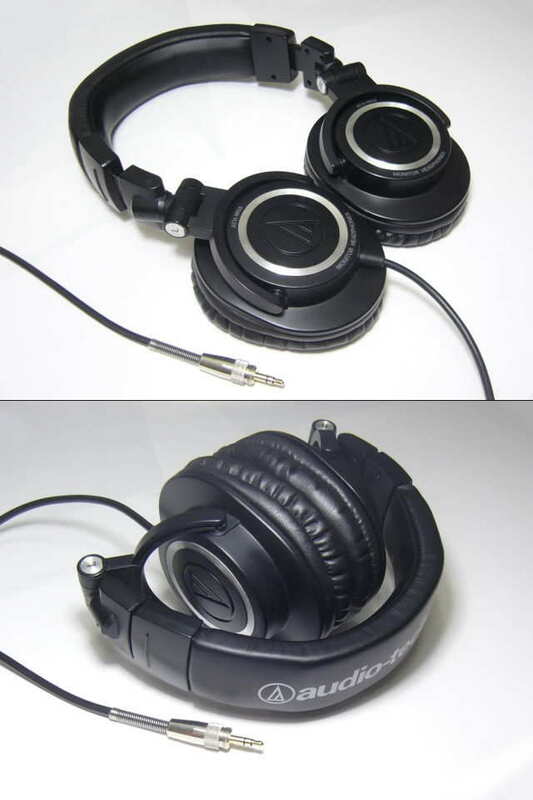 Additionally, the ATH-M50 is far lighter than higher-end Ultrasone DJ cans such as the Ultrasone Pro 650, making it a bit more comfortable in the long run. Like most circumaural phones they can get a bit hot and sweaty, though. Isolation (8/10): The soft pads and moderate clamping force result in impressive isolation, up there with the harder-clamping HFI-450 and much larger Pro 650. Sound (8.75/10): During my initial listening sessions with the ATH-M50, I was stricken by how neatly the headphone slots in between my two other favorite circumaural DJ cans – the Denon DN-HP700 and Ultrasone Pro 650. Since the ATH-M50 is currently a very popular – some would say FOTM – closed can and reviews are plentiful, I will try to focus more on comparisons with the HP700 and Pro 650, as well as my go-to HD25s. I’ve seen the ATH-M50 described as being bass monsters, balanced, V-shaped, and everything in between. Truth is, the Audio-Technicas are incredibly versatile headphones. Unlike the Ultrasone Pro 650 and, to a lesser extent, the Denon HP700, the ATH-M50 can be satisfied by a decent portable source, but only just. If forced to forego amplification, I would undoubtedly pick the M50 over both the HP700 and Pro 650. As usual, I started my comparisons with bass tests. The low end of the M50 is definitely plentiful by my standards. The bass is full-bodied and has great depth and smoothness. Mid-bass is punchy, clean, and controlled. The bass of the Senn HD25 is still a bit quicker but the Audio-Technicas sound slightly more natural on non-electronic tracks. The low end of the Denon HP700 is also a bit tighter than that of the M50s, especially when both are running off of a dedicated amp but the Denons are unlikely to satisfy a bass lover in ways the M50s can. Compared, on the other hand, to the much pricier Ultrasone Pro 650, the bass of the ATH-M50 is neither as warm nor as smooth but also less boomy in nature. The midrange of the ATH-M50 is clear and competent but it is obviously not the focus of the presentation – the bass and treble of the M50 are stronger in comparison. The recession is stronger towards the top of the midrange but the V-shaped nature of the response really is very mild. Overall detail is quite good though microdetail and texture are still better on the HD25. In contrast, the treble of the M50 is unusually satisfying. It boasts great extension, plenty of sparkle, and excellent detail. It is also very crisp and lags in clarity only slightly behind the HD25. Though the highs share a similar tonal character, the HD25 is far more strident near the top and as a result more fatiguing. Those who are treble-sensitive may want to give the ATH-M50 a pass anyway but it should be noted that the Denon HP700 is even brighter and more sparkly than the M50 is. The treble of the Ultrasone Pro 650, on the other hand, is quite de-emphasized compared to the others and is unlikely to fatigue anyone, all at the expense of a bit of detail and resolution. When it comes to presentation the ATH-M50 again holds its own quite easily against the competition. The soundstage has good depth and width for a closed can and doesn’t sound particularly intimate (a-la HD25) or distant (a-la both of my Ultrasones). The tone is a bit warm compared to the brighter and less bassy Denon HP700 but quite close to neutral on the grand scale. Imaging and positioning are quite solid as well for a $100 can, especially when amped properly – better than those of the HP700, which sounds more airy and spacious but doesn’t separate instruments as precisely as the ATH-M50 does. On the whole the presentation of the ATH-M50 won’t put the fear of being sold off into my pricier full-size cans just yet but will give anything in its class a run for the money. Value (9.5/10): The Audio-Technica ATH-M50 may be the most widely-recommended headphone at head-fi at the time of writing, and with good reason – the set manages to be well-rounded and fun at the same time – two qualities many undoubtedly find desirable in a portable set. Add in a combination of durability, comfort, and isolation to match the best portable headphones on the market and we can see why the popularity of the M50s is justified. It’s not the be-all end-all portable solution for everyone – some will undoubtedly find the bass too heavy, the treble too aggressive, or the upper mids too de-emphasized – but that’s the nature of the hobby. For those who would end up going insane asking ‘what if’ when using the ATH-M50 unamped, there’s the Numark PHX Pro. For everyone else, the Audio-Technicas are easily worth the asking price. Just a heads-up. You still haven’t figured out why this review is not showing up in the ‘portable headphones’ list, and also in search. Hi Joker, I have owned a pair of ATH m50x for quite sometime and the ear pad is cracking with PvC falling off. Appreciate your recommendation on which replacement ear pads are the best as I truly love the sound of of m50x . Thank you in advance. How would you compare the ath-m50x to the original Creative Aurvana Live ? Especially sound signature wise? I am thinking about getting one of them, price is not the key point really. I mostly listen to rock, metal, pop and hip-hop. I also dabble in a few more genres like Electronica, r&b. I think the M50/M50X are both very versatile cans, but a little more studio/audiophile in sound tuning than the more consumer-oriented CAL!. They’re not as warm and smooth as the CAL!, but a little more “reference” with a more neutral tone and a balanced/mildly more v-shaped sound. Clarity may be a little better and the overall frequency response is a little broader on the ATH, but overall they’re in the same ballpark. Good day, I’ve been thinking of getting a decent pair of headphones (like this) for some time, and was wondering if you had any affordable amps ($100-ish) to recommend. Also, forgive my ignorance on the subject, but do amplifiers really make that big an impact on sound quality to justify spending nearly as much as the headphones on it? It seems that unless I was looking for something past the ($300-$400) range, I may as well just go for a better pair of headphones, yet it seems almost taboo on some forums to mention headphones without an amp. Thanks for the help! Amps are a complex topic and how much of a difference one will make depends to a large extent on your source, and of course your headphones, ears, and also expectations. Normally I do tend to agree that a better headphone makes more of a difference and a better investment as long as your source is decent. There’s no magic involved, but if you are realistic about it and don’t expect to hear a major difference immediately when adding an amp to your chain, one will help extract the most out of your headphones (which you, presumably, paid a good amount for and already like). I don’t have a lot of experience with the current crop of sub-$100 amps but I like my old $90 Fiio E07k. Not sure if they still make it or not. Fair enough! I guess I should do more research and take a closer look at Fiio’s lineup. Are there any portable sources you would recommend? On a side note, I’ve been following your content ever since it was a headfi thread, and I must say the comprehensive reviews are immensely helpful to an amateur like myself. Your effort is much appreciated! I’ve only tried a handful but I liked the Fiio X3. It’s among the cheapest “audiophile” players I’ve tried and the interface isn’t great, but if you just need something that does a good job with music, the X3 is it. My main is a HiFiMan HM-901 but because of the price that’s pretty hard to recommend, and the interface is arguably worse than the X3. Hello! Thanks for your great reviews. They are incredibly helpful. I really like the sound signature and presentation of my Ath M50X. Are there some IEM’s that you could recommend with a similar sound signature and presentation? Could you recommend a few around $200 and some under the $150 range with a similar sound signature and presentation? Is it possible to get a presentation as open as an over ear from an IEM in this price range or would I have to spend more or does the size of the IEM just make this too difficult? I’ve tried the RHA MA750 but the metal housing makes the Tragus of my ear protrude forward uncomfortably. I’ve listened to the Sennheiser Momentum IEM’s but I felt like the presentation wasn’t as open. I read in your review that the VSonic GR07 BE had a clear sound but less bass than the Momentum. Your recommendations would be greatly appreciated! Hmm… that’s a tough question to answer. I personally don’t like comparing headphones to IEMs because there’s such a difference in the way you perceive sound from each before you even start getting into the tuning differences between them. The things that you perceive most differently are going to be the bass and soundstage (with IEMs usually having a more sealed sound and less impact at the same level of bass boost). At the same time, some people actually find IEMs to have an advantage in how easy it is to hear fine details, and also in imaging. The GR07 BE is a good one if you found the MA750 uncomfortable (and especially if you thought its bass to be overly prominent). Objectively speaking the response of the M50X is probably closer to the regular (non BE) GR07 but again because of how much more air the full-size can is able to move, the GR07 BE is the safer choice. The Philips Fidelio S2 is another good one with perhaps an even more open (but arguable also more flat/less 3-dimensional) sound and slightly less tendency towards sibilance than the GR07. It has a larger footprint in the ear than the GR07 but is worn differently from the VSonics and RHAs (more like an old-school earbud, with a shallow seal). I’m trying to decide between the m50 and the fa-003 (or one of its variants). I like the m50 more but all reviews are saying it lacks sound stage while the fa-003 has a wide one. Does a better sound stage always mean a more enjoyable experience or does it depend on the music type and recording environment? Well, first and foremost it depends on personal preference. Some people do like more forward presentations and more intimately portray the music. Beyond that, yes, whether a “wider” soundstage really makes for a better experience is debatable and depends on many other factors. I personally find the soundstage of the M50 to be good for the money. Maybe not the absolute best out there, but more than sufficient for this class of headphone. Considering purchasing this model for my husband who wants headphones mainly for in-flight movies and TV. It appears that sound quality is good, what about jet noise cancelling? So, I snagged a pair and go them yesterday, damn! What an upgrade. Loving these cans. I was curious about your opinion on portable DAC to go with my iPhone and Fiio model E06 amp. This is my first real foray into seriously upgrading my listening gear, and I’m interested in anything that can improve the experience. As an Android user I don’t have any experience with iPhone DACs but my guess is you won’t need the E06 anymore – it’s not going to better than whatever amp is built into your DAC. Also, it’s most likely that you’ve already gotten you largest improvement with the new cans. The magnitude of any additional gains with upgrades to your chain will pale in comparison. Thank you for any help you can give me with this decision! I don’t have a current-gen touch but with the ones I’ve tried the difference was minimal. If you do get an amp, don’t get it right away – get the cans first and see if you’re happy with them as is. One of the good things about the E7 is that it also has a bass boost function if needed. I’m definitely a cautious shopper, and I will definitely hesitate before deciding on an amp. I’m certainly not the most experienced when it comes to audio, but once I’ve had some time to experience the cans I’ll leave another response with my decision regarding the amp just in case someone in a similar situation sees this page. I feel obligated to say thanks again, your reviews were really helpful in picking out and understanding the vast spectrum of quality sub-$200 headphones! Glad the reviews have been useful! Okay, so I’ve had the m50’s for a couple days now, and I’ve used them with my iTouch (5th gen) Desktop (with whatever integrated audio card came with it) and Macbook. All in all the sound doesn’t seem to differ between all three devices. I don’t have an amp to use for comparing, but as long as I have a good EQ selected for whatever music I’m listening to, I really wouldn’t say the ipod needs an AMP. I’m not some bass-head who needs to be blown away by deep bass, so just by putting the volume around 40-60% and selecting a slightly more bass heavy or V shaped EQ made the m50’s really enjoyable! All in all I almost feel like they haven’t quite lived up to the hype (I’m upgrading from a 20$ pair of monoprice over ear studio headphones) but I still can appreciate the sharper sound and the big difference in comfort. The only other thing I’d like to see involving a review of this headphone would a be a comparison between the m50 and the m50X. I’m curious to see if that 50$ price difference is actually warranted, or just an attempt to make money off a really well renowned pair of headphones. 1. Is it sensitive enough to sound loud on most android phones? (most android phones aren’t loud enough while using headphones, compared to iPhone) or do i really need to use an amp on this one? 2. How does this compare to ATH-M40? I read on the thewirecutter.com ( http://thewirecutter.com/reviews/the-best-150-over-ear-headphones/ that ) that ironically, the cheaper M40 sounds better and the M50 sounds more boomy and the treble tinny, so im not sure which one to pick. Their sensitivity is above average as far as full-size cans go. Ultimately it probably depends on the phone but they were more than loud enough with my Nexus 5. I haven’t tried the ATH-M40 but I’ve found the wirecutter’s opinions in regards to sound quality to be off the mark more often than not in an effort to make recommendations more suitable for the mainstream consumer. They named the rather bassy and somewhat harsh RBH EP1 their best sub-$200 earphone, for example. Ultimately, their purpose and their outlook are both different from what Joe and I do here on this site. Hey Joker, I was looking at the Audio-Techna ATH-M50xBL Professional Studio monitor Headphones on Amazon,http://goo.gl/5TXox6, but when I came here to look and see if there was any info I found this page which seems to be a cheaper version maybe with a few less bells and whistles. I currently love my Sennheiser HD203 Closed-Back Headphones, which in and of themselves was an upgrade. But I’m wanting to make a serious upgrade, on or over ear cans. I listen to a lot of rap, rock and classical music, but also listen to a fair number of audio books. Any suggestions?? For the $$ 150-200 range are there other options I should be checking out?